Gwenpool is back and looking to join the Avengers. In The Unbelievable Gwenpool #21, our titular hero is set on the task of brainstorming just how to join the illustrious and well-paying team. Unfortunately, her ideas are far from entertaining. We start off with the city in trouble from a snake-controlling villain called The Master. Then, just as quickly, it’s not. But oh no! Now Gwenpool is being arrested — nope, wait, she’s fine. The constant stop-start of action is enough to give you whiplash and is, unfortunately, not even the biggest problem with #21. The real issue is the blink-and-you’ll-miss-them nature of the villains and how completely forgettable everything is. Their outlandish appearances and gimmicks are meant to draw attention, but only work for a cheap laugh. No one is expecting Paste Pot Pete to become a fixture in comics, but his over-the-top antics don’t garner much attention when everyone is operating on the same level of ridiculousness. And we’re given no space to really breathe. Every page is trying to cram something in and absolutely none of it works. Any chance that Gwenpool has of being interesting disappears with the constant interruptions of what could be dramatic moments in order to shove in more bland humor. This issue did expand on her abilities, but the attempt at more of an edge on Gwen falls flat. Yes, she can do some incredible things thanks to knowing she’s in a comic book, but any attempts at taking her as serious threat seems impossible sandwiched between the fluffy dialogue. Writer Christopher Hastings does a great job of keeping the tone light, but the dialogue often strays in cringe-worthy territory as Gwen alludes to how things work in our world. A particular throwaway line about how cops work made me wrinkle my nose at the bad taste. The shining part of the comics is really the art. Irene Strychalski has a chipper style that almost makes up for the lack of anything of consequence happening. When Gwen uses her abilities to push villains out of the pages, the 3D effect is drawn well. It’s a pleasure to look at in a way that makes me even more disappointed at the general blandness of the story. All in all, this issue is filler. It sets us up for a potential showdown between Gwen and Doom, but really — do any of us think she stands a chance? 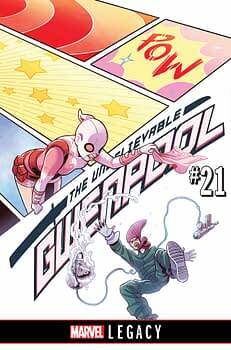 You can pick up The Unbelievable Gwenpool #21 October 11th for $3.99.